Apollo Window Tinting happily provides premium window film and tinting services in Phoenix, Peoria, Glendale, Scottsdale, Tempe, Mesa, Gilbert, Chandler and all of Maricopa County. We pride ourselves on our excellent customer service and our great reviews confirm it. We go above and beyond by making ourselves available after regular working hours, 6 days a week, to accommodate your busy schedule. On many occasions we can complete your installation within 24 hours. Emergency fees? No way! Never! If we can fit you into our schedule then that's it. We won't take advantage of your situation. Great team - amazing work - love this company. Even the best window films will not live up to your expectations if they’re not properly installed. For this reason, the IWFA accredits dealers and installers that have received extensive training and have passed tests developed and administered by the IWFA. Tinting that keeps your car cool in the summer. Living in Arizona, your vehicle can get extremely hot baking in the scorching sun. Automotive tinting is a great way to reduce your car's heat, whilst making it look the part. We offer a range of automotive tints which carry a Lifetime Warranty. So you can rest assured that your car will stay cool every summer. And our air conditioned bay will ensure that the application of your tint will be superior. Get in touch with us today and we'll get your car set for the summer! Excellent service. Quick friendly workers. Great product. Very happy with Apollo and recommend highly. 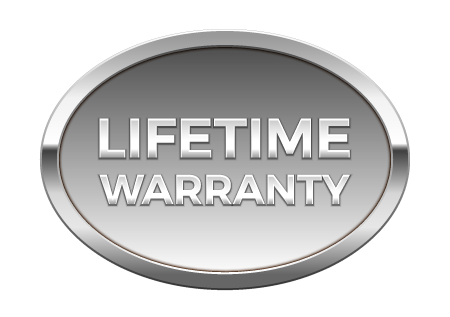 All of our Automotive Tinting products carry a lifetime warranty! Industry leading solar window film. We're a proud installer of SunTek and Madico window films. We choose these suppliers because both window films have proven adhesive systems that are very much like "super glue" that dries hard rather than the typical "sticky" adhesives that often bubble up over time. Both brands build U.V. protection into more layers than their competitors which results in sustained U.V. protection of 98% or better. Other brands drop down to levels of only 60% after as little as 3 years. They have superior scratch resistant coatings that hold up well under normal cleaning conditions. SunTek and Madico window films utilize very high grade metals which allow them to block out more heat than the competition without having to go as dark. Don't delay. Get a fast online estimate in only a couple short minutes. 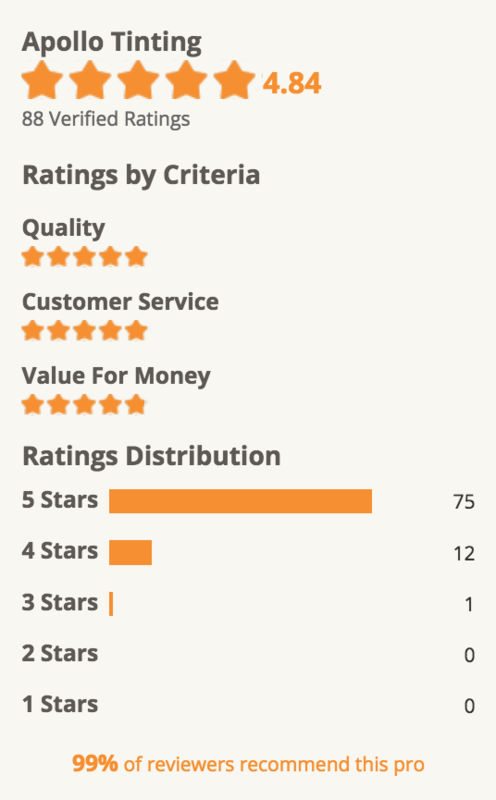 More than 100 homeowners just like you have reviewed Apollo Window Tinting on HomeAdvisor. I had some pretty large single pane windows that needed to be tinted. I sent out several requests for quotes and appointments. Apollo actually contacted me back on the holiday and set-up an appointment for a quote. NONE of the other companies even responded. They installed a solid quality product that has done exactly what they promised. The windows are protected now - heat penetration into the room is vastly reduced and the amount of natural light into the house is only slightly different. Can't recommend these guys enough! Why choose solar window films? 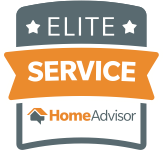 Apollo Window Tinting has been an active member of the HomeAdvisor network and has met their high standards of professionalism and great service for more than 5 years. A wide range of decorative films. Our high quality decorative films can be used for a variety of commercial and residential applications. They can be used for privacy, to enhance a decorative theme, or to stylize your glass. With our extensive selection of colors, textures and patterns we're sure to have something to suit your taste and decor. If we don't have exactly what you want, we can likely order it in. Call us today, we'll be happy to help. Apollo Tinting did amazing work for me. I had just remodeled a home including new French doors with side lite windows in both the master suite and den. The glass on these items was to be decorative. It was delivered as clear glass. After researching the matter, I found it would cost more to fight the human error issue and looked to the alternative. I worked with Apollo Window Tinting to find the product and design of choice. They ordered and had it installed in less than 2 weeks. Here is the best part. You have to know its not decorative glass to know its not. It looks just that good. I encourage anyone looking to make a cosmetic change to your home and windows to consider this option. Homeowners have given Apollo Window Tinting an overall top rating and they highly recommend them to others. Ultimate protection for your windows. Anti Graffiti window film blocks out ultraviolet rays while helping deter smash-and grab robberies. They can be installed on residential, commercial, and government properties. If your glass is vandalized with anti graffiti film installed, your film can be replaced at a fraction of the cost of window replacement. Their crew was on time, professional, friendly, and did a fantastic job on our windows. Would highly recommend them. Unfortunately, vandalism and accidental scratches do happen. Especially in larger cities with high amounts of traffic. Our scratched glass repair technicians can repair your glass to a beautifully restored state. And it costs a fraction of what you would pay to replace your entire pane of glass. Call us today, and we'll send one of our trained technicians right out to evaluate your damaged glass. I am so impressed by their work I had to get on here and write a review. These guys worked tirelessly until everything was perfect. The work looks amazing. The guys were incredibly careful, and the best part, they were INCREDIBLY CLEAN! There isn't a trace of anything left on the ground. I am amazed. I would recommend them ten times over. Customers of Apollo Window Tinting have rated them highly for superior customer service.